The Sistine Chapel in Vatican City contains two of the world's most celebrated frescoes, "Genesis" and "The Last Judgment". The first is a set of Genesis-themed frescoes painted on the Sistine Chapel's high vaulted ceiling by the then young Michelangelo. He began the project in 1508 and finished four years later. 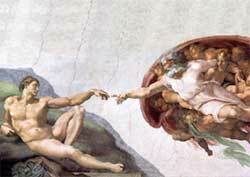 His best known Genesis ceiling fresco depicts God creating Adam (see photo). Two decades later, Michelangelo painted "The Last Judgment" on the large wall behind the altar. It took him six years (1535-1541) to complete it. Michelangelo's works are not the only treasured frescoes in the Sistine Chapel. One is Botticelli's "Temptations of Christ", a masterpiece. The only way a tourist can reach the Sistine Chapel is through the Vatican Museums (which, is a Hillman Wonder Silver Medal winner). The Sistine Chapel is more than an art lover's paradise. It's the room where cardinals from around the world convene to elect new popes.